For other uses, see Monkey (disambiguation). For the monophyletic clade, see Simian. Monkey is a common name that may refer to groups or species of mammals, in part, the simians of infraorder Simiiformes. The term is applied descriptively to groups of primates, such as families of new world monkeys and old world monkeys. Many monkey species are tree-dwelling (arboreal), although there are species that live primarily on the ground, such as baboons. Most species are also active during the day (diurnal). Monkeys are generally considered to be intelligent, especially the old world monkeys of Catarrhini. Simians and tarsiers emerged within haplorrhines some 60 million years ago. New World monkeys and catarrhine monkeys emerged within the simians some 35 million years ago. Old World monkeys and Hominoidea emerged within the catarrhine monkeys some 25 million years ago. Extinct basal simians such as Aegyptopithecus or Parapithecus [35-32 million years ago], eosimiidea and sometimes even the Catarrhini group are also considered monkeys by primatologists. Lemurs, lorises, and galagos are not monkeys; instead they are strepsirrhine primates. Like monkeys, tarsiers are haplorhine primates; however, they are also not monkeys. Apes emerged within "monkeys" as sister of the Cercopithecidae in the Catarrhini, so cladistically they are monkeys as well. There has been some resistance to directly designate apes (and thus humans) as monkeys despite the scientific evidence, so "Old World monkey" may be taken to mean the Cercopithecoidea or the Catarrhini. That apes are monkeys was already realized by Georges-Louis Leclerc, Comte de Buffon in the 18th century. According to the Online Etymology Dictionary, the word "monkey" may originate in a German version of the Reynard the Fox fable, published circa 1580. In this version of the fable, a character named Moneke is the son of Martin the Ape. In English, no very clear distinction was originally made between "ape" and "monkey"; thus the 1910 Encyclopædia Britannica entry for "ape" notes that it is either a synonym for "monkey" or is used to mean a tailless humanlike primate. Colloquially, the terms "monkey" and "ape" are widely used interchangeably. Also, a few monkey species have the word "ape" in their common name, such as the Barbary ape. Later in the first half of the 20th century, the idea developed that there were trends in primate evolution and that the living members of the order could be arranged in a series, leading through "monkeys" and "apes" to humans. Monkeys thus constituted a "grade" on the path to humans and were distinguished from "apes". Scientific classifications are now more often based on monophyletic groups, that is groups consisting of all the descendants of a common ancestor. The New World monkeys and the Old World monkeys are each monophyletic groups, but their combination was not, since it excluded hominoids (apes and humans). Thus the term "monkey" no longer referred to a recognized scientific taxon. The smallest accepted taxon which contains all the monkeys is the infraorder Simiiformes, or simians. However this also contains the hominoids (apes and humans), so that monkeys are, in terms of currently recognized taxa, non-hominoid simians. Colloquially and pop-culturally, the term is ambiguous and sometimes monkey includes non-human hominoids. In addition, frequent arguments are made for a monophyletic usage of the word "monkey" from the perspective that usage should reflect cladistics. A group of monkeys may be commonly referred to as a tribe or a troop. Monkeys range in size from the pygmy marmoset, which can be as small as 117 millimetres (4.6 in) with a 172-millimetre (6.8 in) tail and just over 100 grams (3.5 oz) in weight, to the male mandrill, almost 1 metre (3.3 ft) long and weighing up to 36 kilograms (79 lb). Some are arboreal (living in trees) while others live on the savanna; diets differ among the various species but may contain any of the following: fruit, leaves, seeds, nuts, flowers, eggs and small animals (including insects and spiders). Some characteristics are shared among the groups; most New World monkeys have prehensile tails while Old World monkeys have non-prehensile tails or no visible tail at all. Old World monkeys have trichromatic color vision like that of humans, while New World monkeys may be trichromatic, dichromatic, or—as in the owl monkeys and greater galagos—monochromatic. Although both the New and Old World monkeys, like the apes, have forward-facing eyes, the faces of Old World and New World monkeys look very different, though again, each group shares some features such as the types of noses, cheeks and rumps. The following list shows where the various monkey families (bolded) are placed in the classification of living (extant) primates. Below is a cladogram with some extinct monkey families. Generally, extinct non-hominoid simians, including early Catarrhines are discussed as monkeys as well as simians or anthropoids, which cladistically means that Hominoidea are monkeys as well, restoring monkeys as a single grouping. It is indicated approximately how many million years ago (Mya) the clades diverged into newer clades. It is thought the New World monkeys started as a drifted "Old World monkey" group from the old world (probably Africa) to the new world (South America). The most common monkey species found in animal research are the grivet, the rhesus macaque, and the crab-eating macaque, which are either wild-caught or purpose-bred. They are used primarily because of their relative ease of handling, their fast reproductive cycle (compared to apes) and their psychological and physical similarity to humans. Worldwide, it is thought that between 100,000 and 200,000 non-human primates are used in research each year, 64.7% of which are Old World monkeys, and 5.5% New World monkeys. This number makes a very small fraction of all animals used in research. Between 1994 and 2004 the United States has used an average of 54,000 non-human primates, while around 10,000 non-human primates were used in the European Union in 2002. Monkey brains are eaten as a delicacy in parts of South Asia, Africa and China. Monkeys are sometimes eaten in parts of Africa, where they can be sold as "bushmeat". 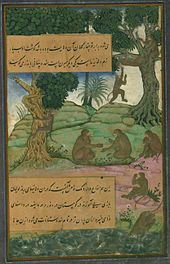 In traditional Islamic dietary laws, the eating of monkeys is forbidden. The Monkey (猴) is the ninth in the twelve-year cycle of animals which appear in the Chinese zodiac related to the Chinese calendar. 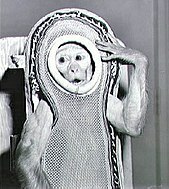 The next time that the monkey will appear as the zodiac sign will be in the year 2028. ^ When Carl Linnaeus defined the genus Simia in the 10th edition of Systema Naturae, it included all non-human monkeys and apes (simians). Although "monkey" was never a taxonomic name, and is instead a vernacular name for a paraphyletic group, its members fall under the infraorder Simiiformes. ^ Fleagle, J.; Gilbert, C. Rowe, N.; Myers, M., eds. "Primate Evolution: John Fleagle and Chris Gilbert". All the World's Primates. Primate Conservation, Inc. Retrieved 18 December 2014. ^ Groves 2008, pp. 92–93. ^ Gabbatiss, Josh. "The monkeys that sailed across the Atlantic to South America". Retrieved 2018-10-21. ^ "Early Primate Evolution: The First Primates". www2.palomar.edu. Retrieved 2018-10-21. ^ Takai, Masanaru; Shigehara, Nobuo; Aung, Aye Ko; Tun, Soe Thura; Soe, Aung Naing; Tsubamoto, Takehisa; Thein, Tin (2001). "A new anthropoid from the latest middle Eocene of Pondaung, central Myanmar". Journal of Human Evolution. 40 (5): 393–409. doi:10.1006/jhev.2001.0463. ISSN 0047-2484. PMID 11322801. ^ "Fossilworks: Catarrhini". fossilworks.org. Retrieved 2018-10-21. ^ "catarrhine (monkey) - Memidex dictionary/thesaurus". www.memidex.com. Retrieved 2018-10-21. ^ Wasson, D. A. (1868). "Epic Philosophy". The North American Review. 107 (221): 501–542. JSTOR 25109409. ^ a b Martin, W.C.Linneaus (1841). A GENERAL INTRODUCTION THE NATURAL HISTORY MAMMIFEROUS ANIMALS, WITH A PARTICULAR VIEW OF THE PHYSICAL HISTORY OF MAN, III THE MORE CLOSELY ALLIED GENERA OF THE ORDER QUADRUMANA, OR MONKEYS (PDF). London: Wright and Co. printers. pp. 340, 361. ^ "Thomas Geissmann's Gibbon Research Lab. : Die Gibbons (Hylobatidae): Eine Einführung". www.gibbons.de. Retrieved 2019-03-15. ^ Osman Hill, W.C. (1953). Primates Comparative Anatomy and Taxonomy I—Strepsirhini. Edinburgh Univ Pubs Science & Maths, No 3. Edinburgh University Press. p. 53. OCLC 500576914. ^ "The Old World Monkeys". www-personal.umich.edu. Retrieved 2019-03-20. ^ "The menisci of the knee joint in human foetuses of manipur population--a morphological study. - Free Online Library". www.thefreelibrary.com. Retrieved 2019-03-20. ^ "Reconstruction of Ancient Chromosomes Offers Insight Into Mammalian Evolution". UC Davis. 2017-06-21. Retrieved 2019-03-20. ^ Naish, Darren. ""If Apes Evolved From Monkeys, Why Are There Still Monkeys?"". Scientific American Blog Network. Retrieved 2018-10-04. ^ Lacoste, Vincent; Lavergne, Anne; Ruiz-García, Manuel; Pouliquen, Jean-François; Donato, Damien; James, Samantha (2018-09-15). "DNA Polymerase Sequences of New World Monkey Cytomegaloviruses: Another Molecular Marker with Which To Infer Platyrrhini Systematics". Journal of Virology. 92 (18): e00980–18. doi:10.1128/JVI.00980-18. ISSN 0022-538X. PMC 6146696. PMID 29976674. ^ Bugge, J. (1974). "Chapter 4". Cells Tissues Organs. 87 (Suppl. 62): 32–43. doi:10.1159/000144209. ISSN 1422-6405. ^ Martin, W.C.Linneaus (1841). A GENERAL INTRODUCTION THE NATURAL HISTORY MAMMIFEROUS ANIMALS, WITH A PARTICULAR VIEW OF THE PHYSICAL HISTORY OF MAN, III THE MORE CLOSELY ALLIED GENERA OF THE ORDER QUADRUMANA, OR MONKEYS (PDF). London: Wright and Co. printers. p. 339. ^ Harper, D. (2004). "Monkey". Online Etymology Dictionary. Retrieved 2013-04-10. ^ "Ape". Encyclopædia Britannica. XIX (11th ed.). New York: Encyclopædia Britannica. 1911. p. 160. Retrieved 2011-07-10. ^ Dixson, A. F. (1981). The Natural History of the Gorilla. London: Weidenfeld & Nicolson. p. 13. ISBN 978-0-297-77895-0. ^ Susman, Gary. "10 Best Monkeys at the Movies". Archived from the original on February 22, 2014. Retrieved February 8, 2014. ^ "If Apes Evolved From Monkeys, Why Are There Still Monkeys?". ^ "Apes are monkeys, deal with it". 2011-04-21. ^ "Are Humans Apes, Monkeys, Primates, or Hominims?". 2012-03-19. ^ "GEOL 204 The Fossil Record: The Scatterlings of Africa: The Origins of Humanity". www.geol.umd.edu. Retrieved 2019-02-06. ^ "AskOxford: M". Collective Terms for Groups of Animals. Oxford, United Kingdom: Oxford University Press. Archived from the original on 2008-10-20. Retrieved 2013-04-10. ^ a b Dobzhansky, Theodosius; Hecht, Max K.; Steere, William C. (2012-12-06). Evolutionary Biology. Springer Science & Business Media. ISBN 9781468490633. ^ a b c "Early Primate Evolution: The First Primates". anthro.palomar.edu. Retrieved 2017-08-12. ^ a b Bajpai, Sunil; Kay, Richard F.; Williams, Blythe A.; Das, Debasis P.; Kapur, Vivesh V.; Tiwari, B. N. (2008-08-12). "The oldest Asian record of Anthropoidea". Proceedings of the National Academy of Sciences. 105 (32): 11093–11098. Bibcode:2008PNAS..10511093B. doi:10.1073/pnas.0804159105. ISSN 0027-8424. PMC 2516236. PMID 18685095. ^ Delson, Eric; Tattersall, Ian; Couvering, John Van; Brooks, Alison S. (2004-11-23). Encyclopedia of Human Evolution and Prehistory: Second Edition. Routledge. ISBN 9781135582289. ^ Nowak, R. M. (1999). Walker's Mammals of the World (6th ed.). Baltimore and London: The Johns Hopkins University Press. ISBN 978-0801857898. ^ "Mandrill". ARKive. 2005. Archived from the original on 2013-05-12. Retrieved 2013-04-10. ^ a b Fleagle, J. G. (1998). Primate Adaptation and Evolution (2nd ed.). Academic Press. pp. 25–26. ISBN 978-0-12-260341-9. ^ Yapuncich, Gabriel S.; Seiffert, Erik R.; Boyer, Doug M. (2017-06-01). "Quantification of the position and depth of the flexor hallucis longus groove in euarchontans, with implications for the evolution of primate positional behavior". American Journal of Physical Anthropology. 163 (2): 367–406. doi:10.1002/ajpa.23213. ISSN 1096-8644. PMID 28345775. ^ "Amphipithecidae - Overview - Encyclopedia of Life". Encyclopedia of Life. Retrieved 2017-08-12. ^ "Eosimiidae - Overview - Encyclopedia of Life". Encyclopedia of Life. Retrieved 2017-08-12. ^ "Parapithecoidea - Overview - Encyclopedia of Life". Encyclopedia of Life. Retrieved 2017-08-12. ^ Marivaux, Laurent; Antoine, Pierre-Olivier; Baqri, Syed Rafiqul Hassan; Benammi, Mouloud; Chaimanee, Yaowalak; Crochet, Jean-Yves; Franceschi, Dario de; Iqbal, Nayyer; Jaeger, Jean-Jacques (2005-06-14). "Anthropoid primates from the Oligocene of Pakistan (Bugti Hills): Data on early anthropoid evolution and biogeography". Proceedings of the National Academy of Sciences of the United States of America. 102 (24): 8436–8441. Bibcode:2005PNAS..102.8436M. doi:10.1073/pnas.0503469102. ISSN 0027-8424. PMC 1150860. PMID 15937103. ^ Hill, C. M. (2000). "Conflict of Interest Between People and Baboons: Crop Raiding in Uganda". International Journal of Primatology. 21 (2): 299–315. doi:10.1023/A:1005481605637. hdl:10919/65514. ^ Siex, K. S.; Struhsaker, T. T. (1999). "Colobus monkeys and coconuts: A study of perceived human-wildlife conflicts". Journal of Applied Ecology. 36 (6): 1009–1020. doi:10.1046/j.1365-2664.1999.00455.x. ^ Brennan, E. J.; Else, J. G.; Altmann, J. (1985). "Ecology and behaviour of a pest primate: Vervet monkeys in a tourist-lodge habitat". African Journal of Ecology. 23: 35–44. doi:10.1111/j.1365-2028.1985.tb00710.x. ^ Bushnell, D. (1958). "The beginnings of research in space biology at the Air Force Missile Development Center, 1946–1952". History of Research in Space Biology and Biodynamics. NASA. Archived from the original on 2013-04-10. Retrieved 2013-04-10. ^ Bonné, J. (2005-10-28). "Some bravery as a side dish". msnbc.com. Retrieved 2009-08-15. ^ Institut De Recherche Pour Le Développement (2002). "Primate Bushmeat : Populations Exposed To Simian Immunodeficiency Viruses". ScienceDaily. Retrieved 2009-08-15. ^ Experts, Disha (2017-12-25). THE MEGA YEARBOOK 2018 - Current Affairs & General Knowledge for Competitive Exams with 52 Monthly ebook Updates & eTests - 3rd Edition. ISBN 9789387421226. ^ Reddy (2006-12-01). Indian Hist (Opt). ISBN 9780070635777. ^ Cooper, J. C. (1992). Symbolic and Mythological Animals. London: Aquarian Press. pp. 161–63. ISBN 978-1-85538-118-6. ^ Lau, T. (2005). The Handbook of Chinese Horoscopes (5th ed.). New York: Souvenir Press. pp. 238–244. ISBN 978-0060777777. Groves, C. (2008). Extended Family: Long Lost Cousins. Conservation International. ISBN 978-1-934151-25-9. OCLC 300051037.